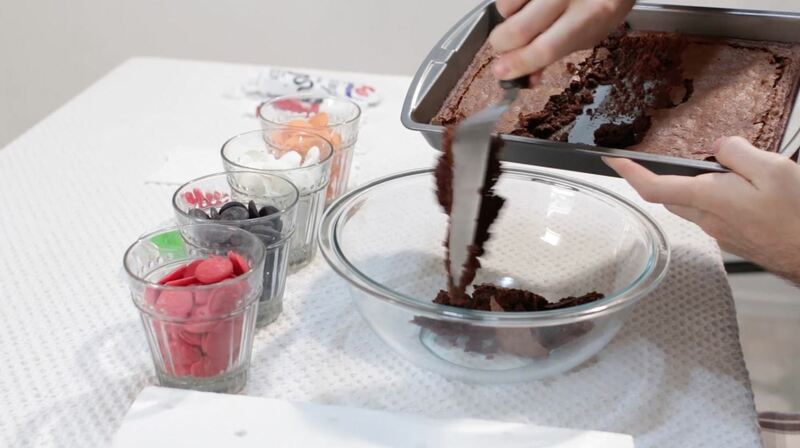 First we will make our brownies. 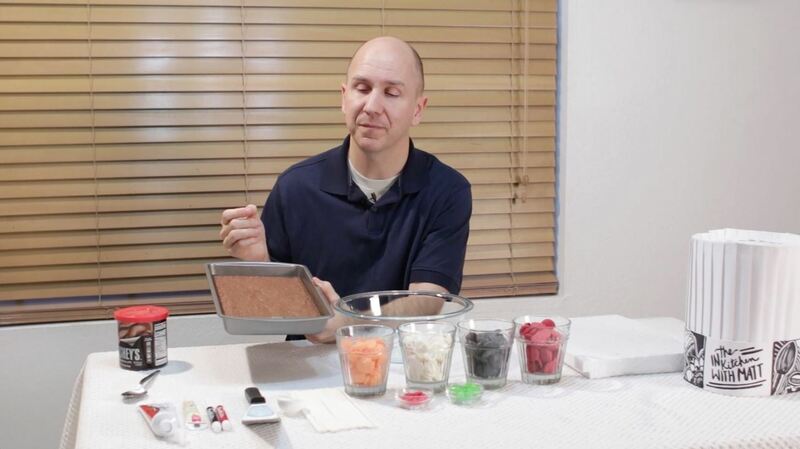 Use your favorite Brownie recipe, or you can follow mine, or just grab a brownie mix from the store. 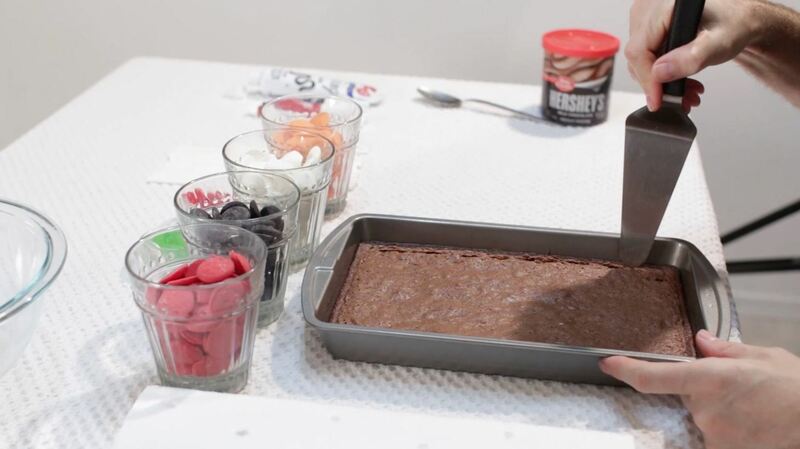 Once the brownies are prepared, let them cool completely. 30 minutes to an hour. Then we will cut along the inside, about a half of an inch from the side. We don't want the side bits, they are too hard. However, those are great to snack on! 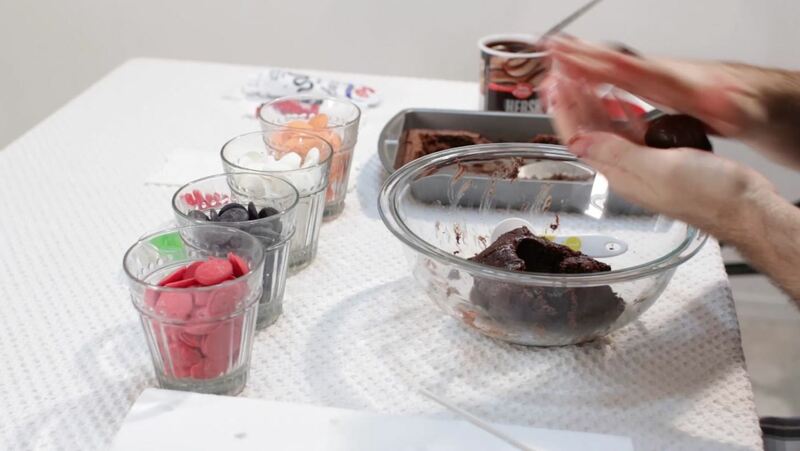 :) Then using some sort of spatula, we scoop out the brownie and place it in our bowl. Next, we add a little bit of frosting. 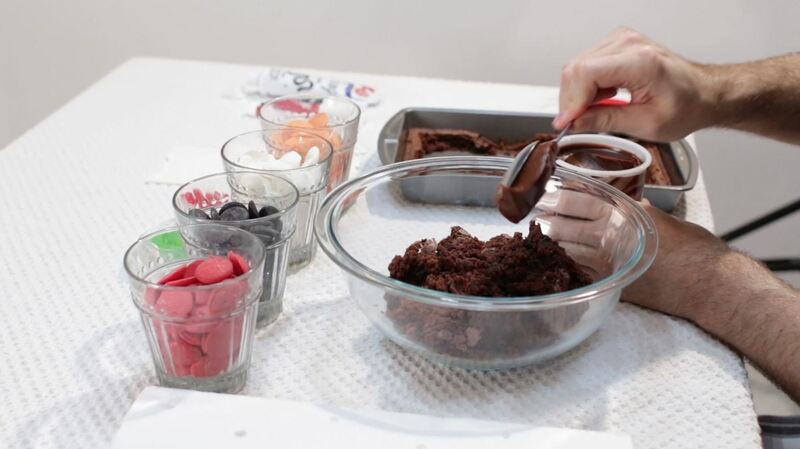 Depending on how "fudgey" your brownie is, will depend on how much frosting you will need to add. If the brownie is really fudgey you may not need to add any. I am adding a couple tablespoons worth. If it is more of a cake-like brownie, definitely add the frosting, maybe start with a 3rd of a cup and go from there. Then mix it together with your hands. 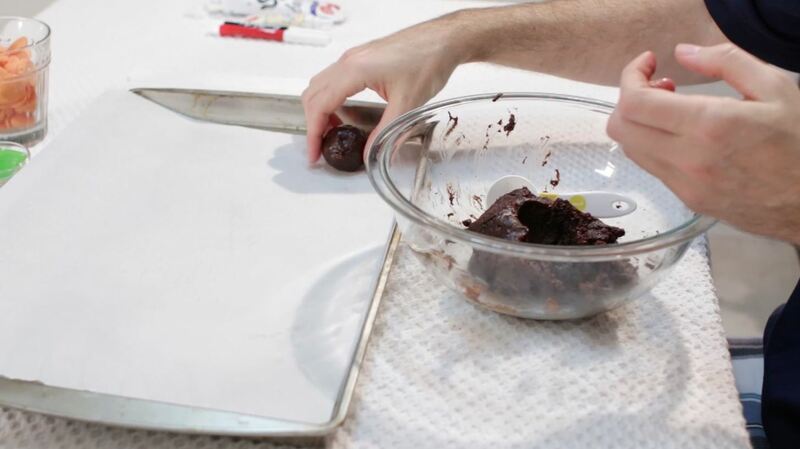 Now we take our little rounded tablespoon scoop and scoop out some brownie, then roll it up into a nice ball, then place it on a parchment paper lined sheet pan. Once we have them all rolled out, put them in the Freezer for 45 minutes to an hour. We don't want them completely frozen. 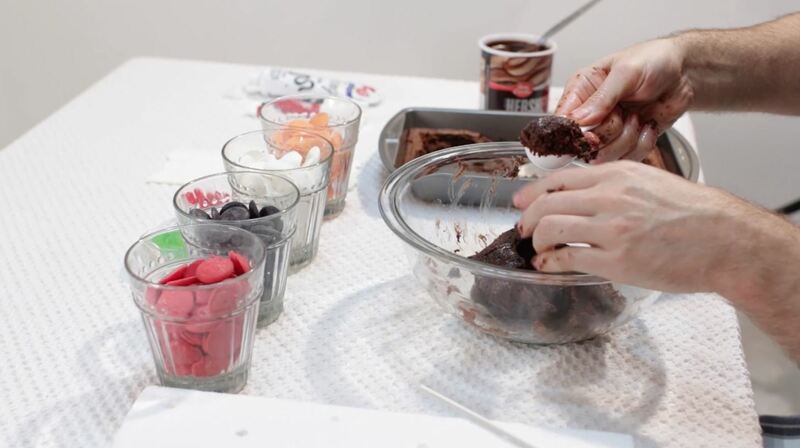 After that we will put them in the fridge, until we are ready to dip them. 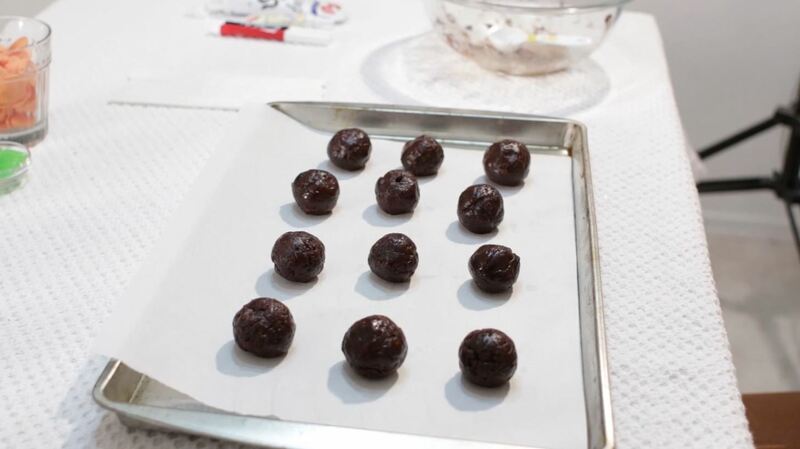 Once the brownie balls have had time to chill, we melt some candy melts. I just put them in a wide glass and melt them in the microwave on hi for 30 seconds, then stir, then 25 to 30 seconds, that usually does it. 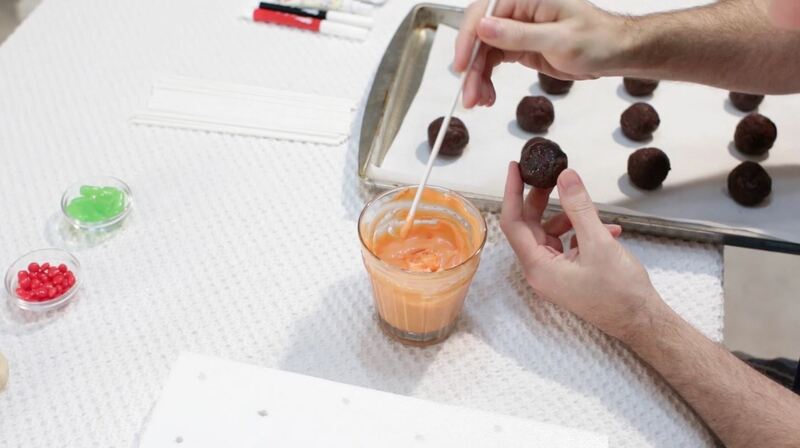 Next dip the tip of your lollipop stick in the candy melt, and then stick it into the bottom of your brownie ball. 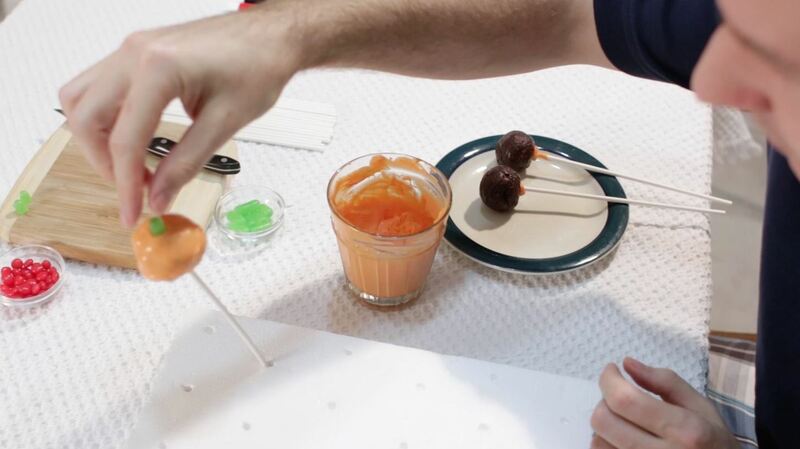 Do this with all your sticks and the colors of candy melts. 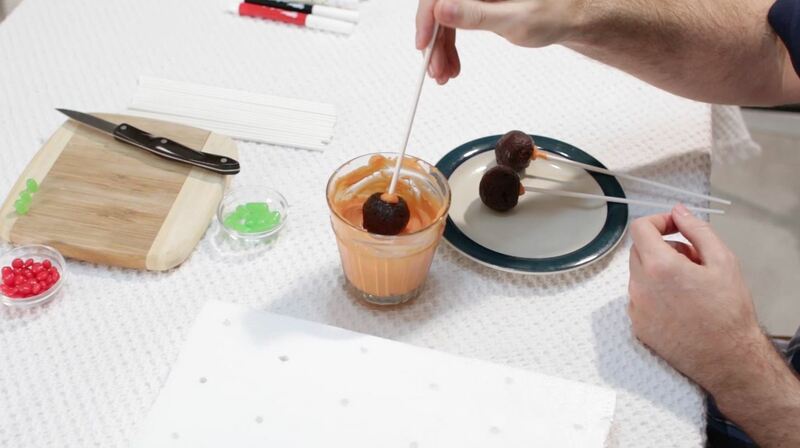 Ideally whatever color you are using for this, will be the color of the whole brownie pop. 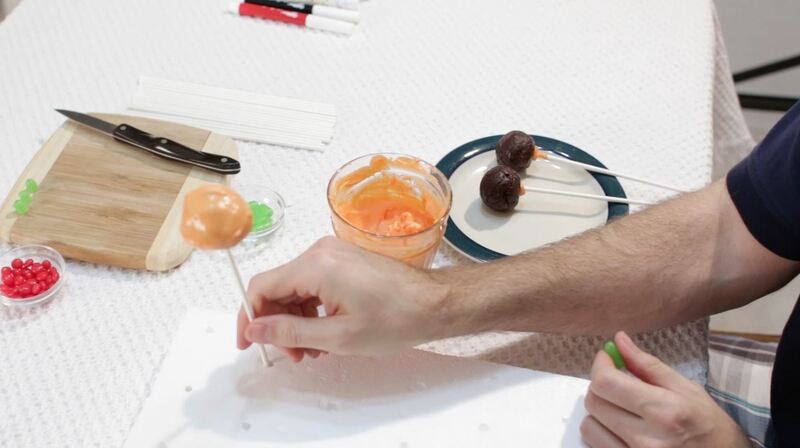 The reason why we are doing this is because this acts like glue to help hold the brownie ball on the stick. Next put them in the fridge or freezer for about 5 minutes to let that little bit of candy melt set. 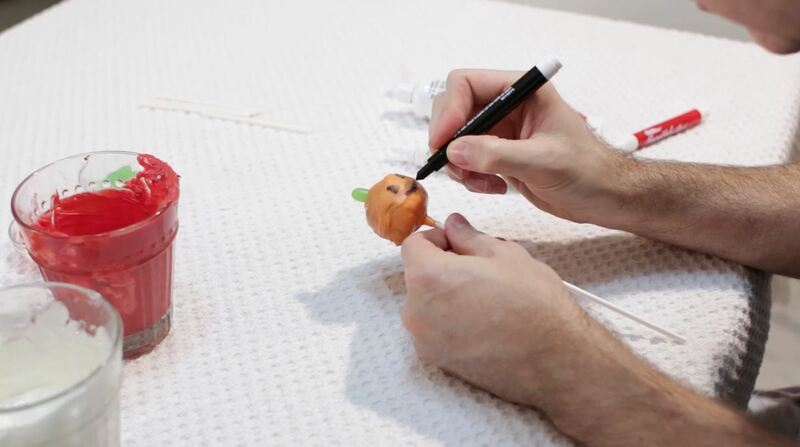 Now for the pumpkin ones, I need a little green top, so I am going to use green Mike and Ikes. :) cut them in half, we don't need the whole thing. Eat the other half. mmm yummy. 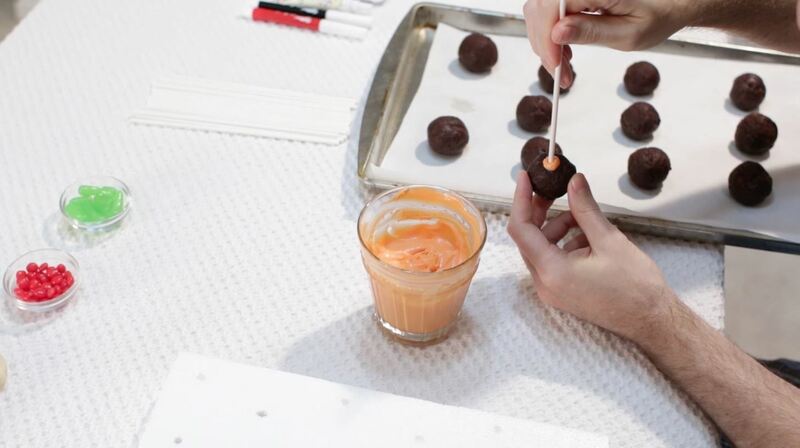 Now once our base brownie pops are chilled, we dip them in the candy melt. Make sure the candy melt isn't too thick. You might need to put it back in the microwave for 10 seconds. 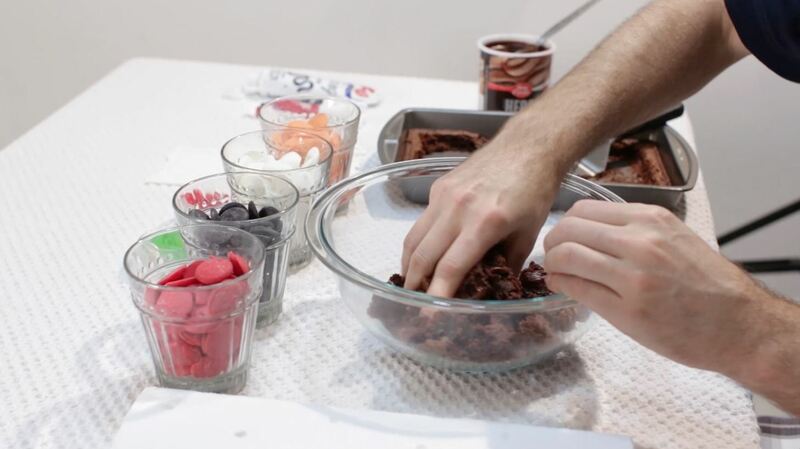 As we dip, we go straight down, don't stir the brownie around in their, it will fall off! You can gently move it around, but not much, then pull it out. Next lightly tap it on your finger, to get the excess candy melt off. Then stick it in your styrofoam block. I just took a piece of styrofoam and poke holes in it, nothing fancy. Then place your little green mike and ike tip on the top. 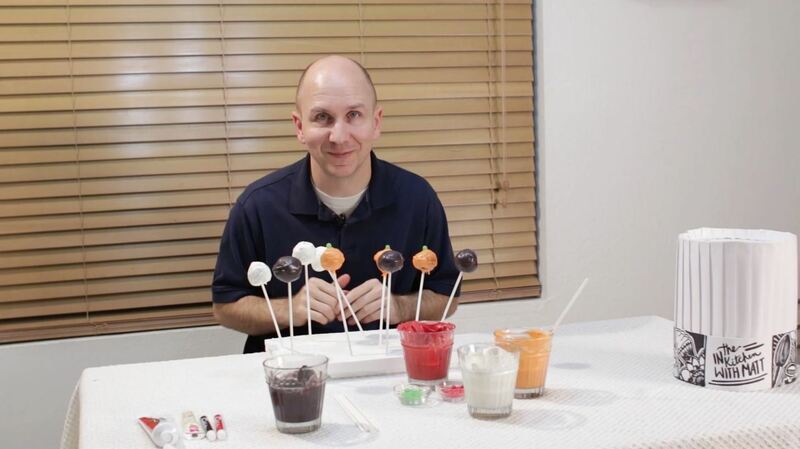 Now we place them back in the fridge for 20 minutes to let the candy melts properly set up. You can also just leave them out at room temperature. It is quicker in the fridge. 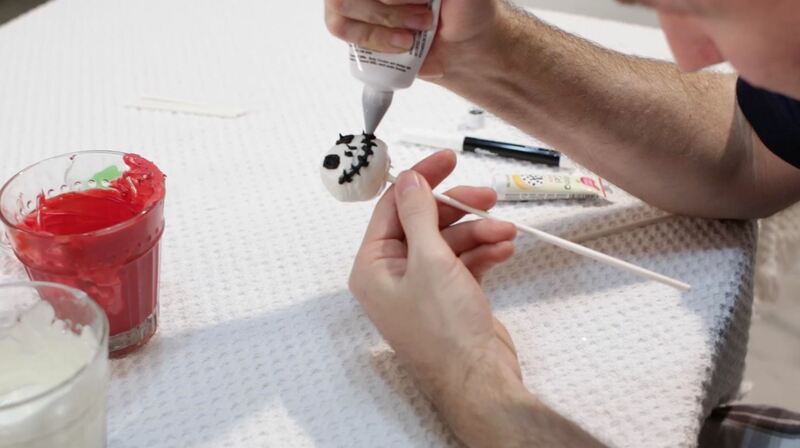 At this time you can prepare your face making items/decorations. There are several options for creating the faces. This option is by using a food writer. I am using one from Wilton. I found mine at Walmart, but you can certainly find them online as well. To be honest, it is not my favorite look, however it does work. I guess I was expecting it to look as clear as a Sharpie would. 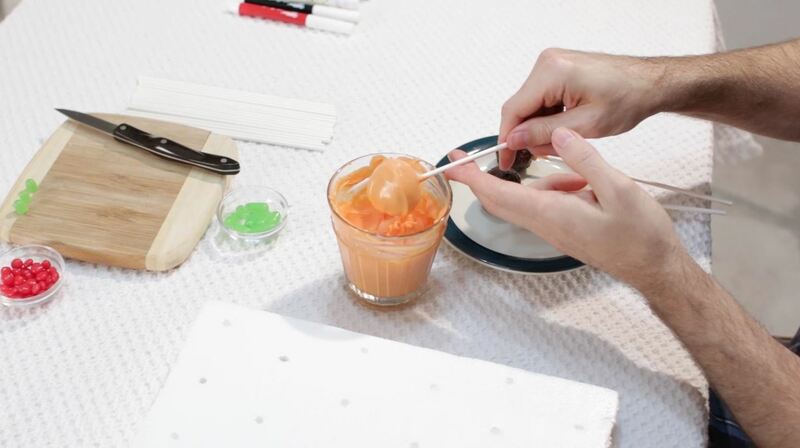 You can also use decorating gel or decorating icing, or just use a little bit of candy melt. 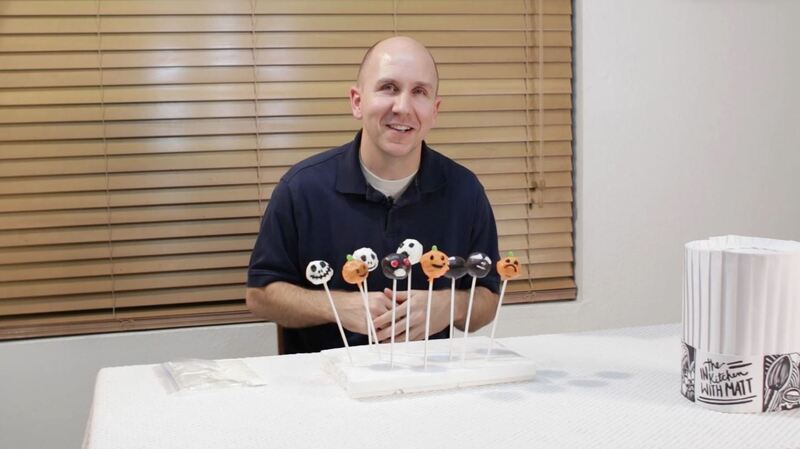 Now we have several different Halloween Themed Brownie pops ready. :) Great for a party, or for the family, friends, whatever! Have fun with it. They taste super yummy too! !